Yellow Wellies Media, 9780990643050, 174pp. 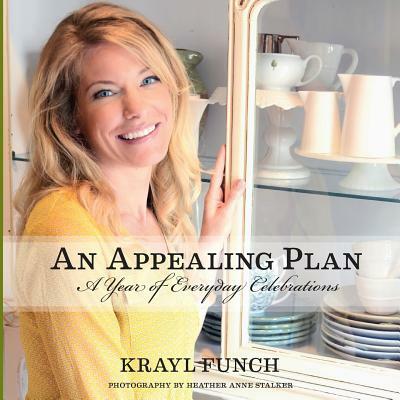 In this charming and beautiful book, Krayl Funch reminds us that every day is cause for celebration. Whether she's sharing one of her favorite garden-inspired entranceway designs or tips on hosting a luxurious dinner party, each gathering is equally breathtaking, and vivid photography brings each menu to life. "For as long as I can remember, I have dreamed of writing a book to inspire others, to remind them that each and every day can be a celebration of the season, of life, and that it doesn't need to be stressful or complicated to be perfect," writes Krayl. Inspired by nature, Krayl's passion for entertaining shines in An Appealing Plan as she takes us through a year of everyday celebrations. From a perfectly themed baby shower to a New Year's open house, Krayl's recipes, tablescapes, and d cor tips are sure to inspire you the whole year through. Each section of An Appealing Plan features season-specific menus and design ideas. Apart from being inspired by the seasons themselves, Krayl also finds inspiration for her recipes from her childhood, travels, and favorite restaurants. Some featured recipes are: Baked Brie with Almonds and Rosemary Syrup, Spinach and Gruyere Quiche, Savory Herb Waffles with Smoked Salmon, Cheese Fondue with Assorted Crudite, The Perfect Roast Turkey, Winter Squash Soup, Citrus-Marinated Olives, and Seared Scallops with Sage Brown Butter, as well as some of Krayl's favorite cocktails and desserts, including Fresh White Peach Bellini, Fall Fig Harvest Cocktail, Summer Fresh Berries, and Wine-Poached Pears.